The northern elevated portion of the Orange Line was closed in April 1975. The "El" was replaced by a new tunnel under the Charles River, with an extension over an old Boston & Maine Railroad right-of-way to Malden. The above photograph was taken in the summer of 1975. The closed Orange Line North Station is on the upper right, before it was demolished. The station platform and canopy are visible. In the foreground, a 2-car trolley is traveling up the ramp to the Green Line platform on the left (not visible in photo, closed in 2004). 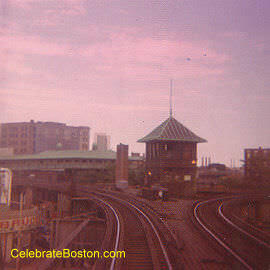 Boston Garden had entrances on the 2nd floor that went directly to the elevated stations, saving time during events. The above photo is from July 1975. It was taken just south of Sullivan Square. Many people considered Boston's elevated lines to be an eyesore, while others believed they were designed beautifully with Victorian elements. 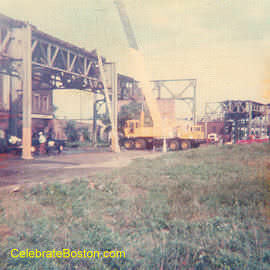 Tower C stood on the elevated railway at Causeway and North Washington Streets, just south of the Charlestown Bridge. It was a switching tower for trains traveling to the Atlantic Avenue Loop (closed in 1938). 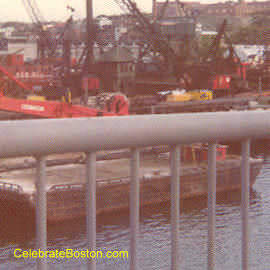 The photo above was taken in 1975 on the Meridian Street Bridge in East Boston. The tower was sitting on a barge awaiting transport to the Seashore Trolley Museum in Kennebunkport Maine. 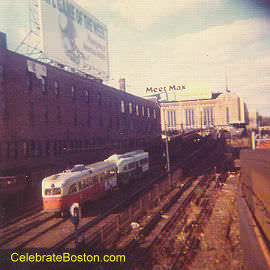 This photo is looking south and was taken in 1976 from the last car of an Orange Line train. The ramp accessing the northbound platform is visible on the left, with Tower F in the foreground. When the El was extended to Forest Hills, the northbound platform was built. Prior to the Forest Hills extension opening, the elevated car operator changed ends at Dudley Station to reverse direction (which originally contained only one double-sided platform for the El cars).